A Noise node has been added which uses value noise. The parameters exposed are seed, octaves, amplitude, frequency, lacunarity, and gain. The main menu bar has been revamped. Added the ability to report a bug via our new GitHub page. New/Open/Save Project should ask you if you want to save your current project before continuing with your action. 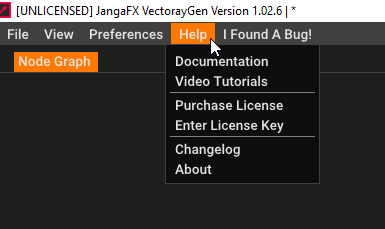 We have updated our help menu to be... more helpful! You can now enter your license via the help menu now. You can now view and open recent projects from the File menu. Your current project (as long as it is saved or opened to/from a .vrg file) is now auto-saved to previous_project.vrg. The last session is no longer automatically restored on startup. Instead, the old project is temporarily stored in previous_project.vrg, which you can restore from Recent Projects in the File menu. Note that previous_project.vrg are overwritten as soon as you open or save a project. You can permanently set your default Project and Preset folder in the Preferences menu. The troubleshooting and tips menu options have been removed in favor of our new Documentation. The Settings panel is now segmented into different tabs. 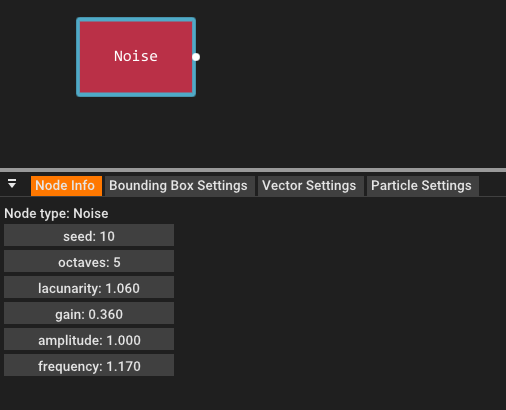 Bounding Box, Vector and Particle Settings have their own tab next to the Node Info tab, while Misc and Bindings have been put into Preferences (from the menu). Preferences will open in its own window. Hovering over window separators should now change your mouse cursor to a double-arrow. Particles can now have their colors represented by velocity via the particle colors menu. You can hide the "spotlight" in the viewport via the Preferences panel. Clearing the Node Graph from the right-click menu, creating a new project, and opening a project will clear the vector field from the viewport. Node connectors now have a larger sensitivity area. You can adjust this sensitivity in the Preferences panel. Pitch, yaw, and roll slider text are now simply called Rotate X/Y/Z. The camera is centered on the node graph when opening a project. We are now gearing up to release 1.03 within the coming month or two. This will be a large update featuring splines, painting fields with your mouse, and other great features!